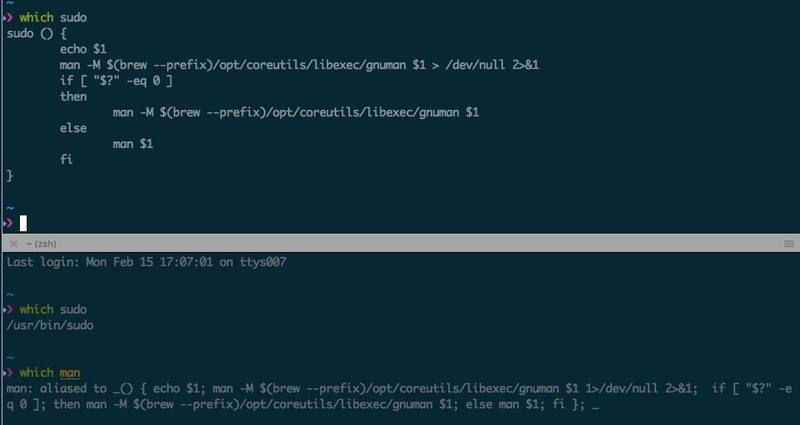 Running GNU coreutils via Homebrew on your Mac? Here's a one-liner to get the manpages working! Follow an article like this describing how to use Homebrew to setup GNU coreutils et al on your Mac. Then when you want to spend less than a minute getting the manpages to work with both your new GNU programs and your Mac programs you still want to be able to use (like mdfind), paste this gist in your ~/.profile and away you go! Where /usr/libexec/path_helper would include them. This solution makes the [section] argument for man fail to work. man 2 read can not find the man page for read in section 2. Strange bug for me. Once i use man ... sudo is aliased to that function. @JacobDorman Do you use oh-my-zsh or prezto? There is an alias for sudo(!) which causes this failure. So try to comment out the line alias _='sudo' or add a line with unalias _ before the man alias. The alias is not working with bash. @tasmo Ahh so there is. I never use that. unalias _ fixes the issue. What's wrong with just putting /usr/local/opt/coreutils/libexec/gnuman at the front of $MANPATH? I have the same question as @OJFord. Why not just export MANPATH="/usr/local/opt/coreutils/libexec/gnuman:$MANPATH"?